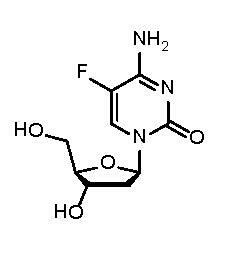 2'-Deoxy-5-Fluorocytidine DNA methyltransferase inhibitor currently in clinical trials for breast cancer and other solid tumors. Like 5’-Azacytidine and decitabine, 2’-Deoxy-5-fluorocytidine is a pyrimidine analog that integrates into chromatin to inhibit DNA methylation. It blocks proliferation in colon cancer-derived HCT116 cells by activating DNA response pathways. It inhibits various strains of pathogenic avian influenza viruses in vitro and in vivo.